Everything you need. 3' X 5' red/white / blue nylon open flag, cast aluminum wall bracket (can also be strapped to poles), and our NEW 6 Foot pole with a built-in swivel finished with a gold ball top. 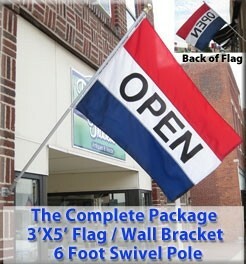 Never have your flag get wrapped around the pole again. The built-in swivel always allows the flag to unwrap to keep it readable.